The Holidays are already the best part of the year, but Kirby’s wants to help you make them even better! Fall is in the air which can only mean one thing – Thanksgiving and Christmas are quickly approaching. Don’t spend hours in the kitchen when you don’t have to – Kirby’s is offering the feast of a lifetime. Whether you’re entertaining relatives or getting together with some of your best friends for Friendsgiving – the Prime Rib Feast is sure to be a hit! Our boneless lion is a full 11-13 pounds, mesquite smoked or slow roasted and accompanied with our house made Au Jus & Creamy Horseradish. Paired with mashed potatoes, green beans, and house salad . And don’t forget dessert! Our apple or pecan pie makes the perfect ending to your feast– feeding up to 12 and priced at just $325, this feast makes your holiday celebration easier than ever! Don’t need the whole feast? No problem! 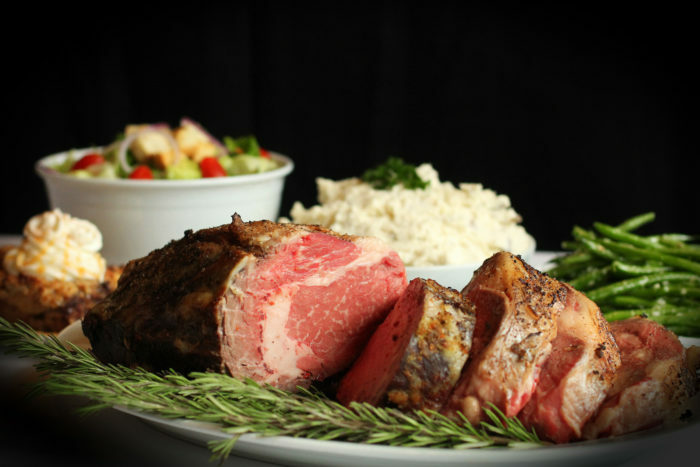 We can offer you just the loin – either mesquite smoked or slow roasted for just $275! We’ve got extra dessert covered too – add another one of our homemade pies for just $20. Quit spending so much time in the kitchen this holiday season, and spend more time with the people you love!